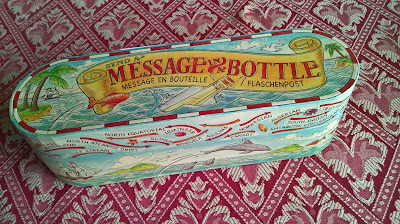 Who among us can resist the allure of any story about a message in a bottle? There's just something mysterious and exciting about the prospect of finding such a note. I’ve always enjoyed reading the success stories of people being contacted when their message is found, sometimes years after they set their missive adrift. In today's news yet another tale of finding a message in a bottle was reported. You can read about it here This time the message in a bottle was found in Australia, when a woman and her husband were walking along the beach. Seeing rubbish that had washed up with the surf, the woman decided to tidy up and take the rubbish home to dispose of. The very first thing she picked up was a brown bottle and inside it was a rolled piece of paper tied with a string. The message was not an actual letter but information from a German ship studying ocean currents. The amazing thing was that it was dropped in the ocean 132 years ago. No matter who releases a message out into the world, there is always an element of hope that goes along with it. That someone, preferably in a far away land, will find it and respond. It's just the same when a letter writer pens that first letter to a prospective new pal hoping to get a reply. My son received the above kit from a very dear friend. We sent it on its way several years ago and every time a story about someone finding a message in a bottle is in the news we start to speculate about our bottle; wondering where it is and if someone will find it soon. The concept of sending a message in a bottle is not a new one, and although it usually conjures images of desert islands and last ditch attempts of being rescued, messages in bottles have been utilized in other ways besides the classic romanticized notion. Using bottles in the sea as a method of communication or study was something the ancient Greeks practised, Benjamin Franklin studied ocean currents in this fashion and Elizabeth I appointed someone to the post of “official Message reader” upon being presented with the news that a mere fisherman had read a secret dispatch that was found in a bottle floating in the Thames. Another more whimsical story is about a wistfully tossed note from Ake, a Swedish sailor, who asked for any pretty girl to respond. A Sicilian fisherman, picked it up and passed it on to his daughter thinking it a joke. Amused, his daughter, Paolina, sent a letter to the sailor. A correspondence ensued; Ake visited Sicily, and shortly after he and Paolina were married. There are quite a few other tales of people happily writing for years as a result of finding a letter sent by “sea mail.” News items emerge regularly of individuals finding sea-bound missives from strangers reaching out their hand in friendship. Of course not everyone is touched or even amused as Paolina’s father was. Some people think it is just refuse and would just as soon the romantics found another venue for their whims. I read of one such encounter in the newspaper where a man here in England picked up a floating bottle, promptly wrote to the author in America telling him his litter was not appreciated. I hope he doesn't find our bottle! A message in a bottle is never an ordinary thing. It has the power to amplify one voice for many to hear. It seems to have found many forms over the centuries but the sentiment still remains the same and that seems to be for love and friendship. Not unlike a lot of us who use the post for the same reasons. Such a wonderful post, Anna. Thank you! Hi Sonja, lovely to hear from you. I have always loved stories of messages in bottles. I hope some day my son's message will get a reply. Thanks for stopping by. You do the same. Thank you for stopping by.